In its 10th season, Eurolanche introduces its members thru the regular weekly series "Member stories". Belize and ice hockey. Honestly, there are many people on this planet who have no idea that such a country even exists. This exotic paradise in Central America is the home of a handful of ice hockey fans. Eurolanche member Myron Thiessen is among them. He was born in Mexico and after he was adopted, his parents moved the family to Belize. Now, he is 28 and growing up a farmer, he is still currently involved in this type of business. “I became an Avs fan around 2002. I had been playing floor hockey for a few years, but I wasn’t really aware of the NHL at the time, so with the help of the internet (because we didn’t have TV channels broadcasting hockey at the time) and the NHL 2001 game, I fell in love with ice hockey and it’s pretty much because of Patrick Roy that I became an Avalanche fan.. He is my most favorite player,” explained Myron, who hasn’t watched any Avalanche regular season or playoff games, yet. He’s only two preseason games so far. For most of fans outside of North America, it’s hard to follow Avalanche hockey due to time differences. It’s even harder when you live in a country which has nothing to do with winter sports. Myron usually listens to radio broadcasts of the games. And he’s not alone. „There are not many hockey fans here. Maybe 10-20 and like three of them are Avs fans. The rest are either Flames, Jets or Maple Leafs fans,” describes Myron. For Myron, the meaning of the Avalanche family is really important. His friends from Twitter already sent him some souvenirs and clothes with the logo of the Avs. “I wear something with an Avs logo pretty much all the time. My friends are amazing,” said Myron, who skated on ice a few times and really enjoyed it. “I actually learned about Eurolanche thanks to Twitter. I think it’s a great site. 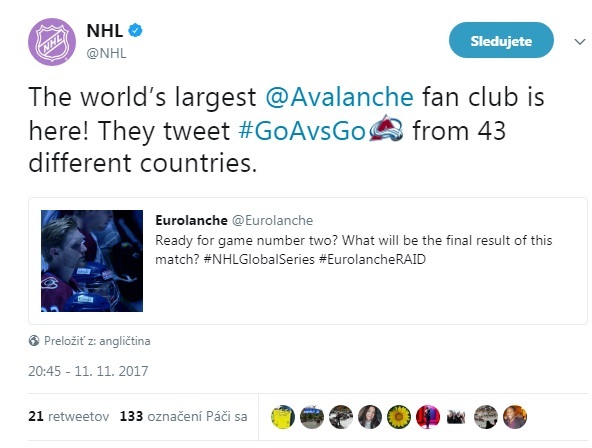 It makes me feel that I am not the only Avalanche fan abroad. Being an Avs fan in Belize is interesting, but I really miss not being able to attend the games,” concluded Myron.